ONE of the most dangerous magical illusions ever seen on stage is to be performed in Yorkshire by a star of the hit TV show Get Your Act Together. Jamie Allan will perform his death-defying version of Harry Houdini’s lethal but rarely seen water tank routine on stage at St George’s Hall in Bradford. 110 years ago Harry Houdini performed on that same stage, in Bradford. He appeared at St George's Hall "For positively one week only"! from Monday 13th February 1905. The stunt has been performed by only a handful of top illusionists since it was invented by the legendary Houdini in 1911. For the first time, an audience will see Jamie Allan shackled before being plunged into a glass water tank. As the clock ticks, loudspeakers will amplify the sound of Jamie’s heart as he struggles to free himself before losing consciousness, adding one of many state-of-the art touches to Houdini’s masterpiece. Jamie entertaining millions on ITV last month by teaching comic Rufus Hound to saw a woman in half with an industrial laser beam. But his water tank routine sees Jamie bring an even sharper edge of danger to his act - iMagician: The Evolution of Magic. After mesmerising American audiences for 12 years with his fusion of magic and technology, Jamie is now set to launch his spectacular UK tour in Yorkshire. His world class sleight of hand and breathtaking feats of trickery and illusion are combined with state of the art technology. 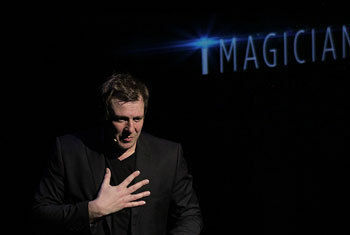 Jamie’s shining talent has been recognised by the cream of the entertainment and corporate world, where he has performed some of the most awe inspiring illusions in the history of magic. • Making a £180,000 Robinson R22 helicopter vanish and reappear, live on stage during the maiden voyage of the Queen Mary II – a trick he repeated on TV for millions of viewers. • Making the new Mercedes Benz M Class appear from thin air at the car’s UK launch. These astonishing tricks have earned Jamie a reputation as one of the most respected and accomplished magicians in the world. iMagician explores the work of the legendary Harry Houdini, then uses modern technology to make them even more mind blowing. In this action packed show, audiences will witness some of the most incredible illusions ever staged. Using the latest technology, iMagician includes high powered laser beams, iPads, Twitter and Facebook. New to this show is the mind blowing ‘Virtual Assistant’, a routine which involves “her” passing in and out of a digital world. Jamie has headlined at The London Palladium, and he has worked in all aspects of the entertainment industry – as performer, producer, director and writer of a vast array of TV and theatre projects throughout Europe and the USA. He has already become an instant family favourite after hitting UK TV screens. His appearances include ITV’s The Alan Titchmarsh Show, BBC’s The One Show, BBC Breakfast and CBBC’s The Slammer.